What is LOLA Doing to Support Arts in Education? - Land O' Lakes Area Artisans, Inc.
We bring vital arts education resources to local schools. LOL Elementary students participate in a Shakespeare Workshop. LOLA has conducted theater, art, and poetry classes for Land O’ Lakes elementary school and SOAR Charter School, providing students supplementary arts education to what they already received in their school’s curriculum. LOLA has also established a partnership with the Watersmeet School. The school was struggling to find a certified art teacher, leaving students lacking in their arts education. LOLA saw a need that had to be filled and stepped up to the challenge to bring special arts programming to the school as well as host classes at our Creative Campus. Watersmeet superintendent Gerald Pease acknowledged our partnership as “a wonderful opportunity” and stated he appreciated that LOLA offered this to the district because “it is going to give our students a greater exposure to all the arts which we couldn’t give them.” LOLA is in the process of working with Watersmeet School to establish the schedule and curriculum for the 2018 school year. We maintain partnerships to provide more diverse arts education. LOLA continues to work with The Summit Players Shakespeare Group to facilitate theater workshops at local schools and on LOLA’s Creative Campus. In spring, LOLA brought the Summit Players to the Watersmeet School to present a theater workshops for 1st-6th grade students. LOLA Programming Director Wendy Powalisz came back to LOLA with encouraging accounts of student success. Students who had previously struggled with academic engagement were actively participating in the workshop and young people were excitedly (and accurately) interpreting period language. We provide arts education for home school students. Home school students working on illustrating stories with Amy Laundrie. LOLA has been providing arts education for home school students since LOLA’s inception in 2008. Painting, drawing, 3-d work with wire, clay, and creating art using recycled materials are a few examples of classes LOLA has offered home school students. Classes have focused on specific artists, masters as well as contemporary, including Matisse, O’Keefe, Chihuly, Monet, and Van Gogh. Students also learn about techniques and materials, the principles of art, elements of design, the color wheel, and art from other cultures. Class starts with a discussion on the artist, culture, materials or the principle or element with visual aids and samples. Next, the teacher gives a demonstration of the project and a safety lesson before proceeding. Then, on to the project with the teacher assisting throughout the process but not impeding the individual expression or each student. Each class ends with students explaining their finished project and then receiving critiques from the other students. We offer arts education opportunities all year long, with special emphasis on youth programming during the summer months. 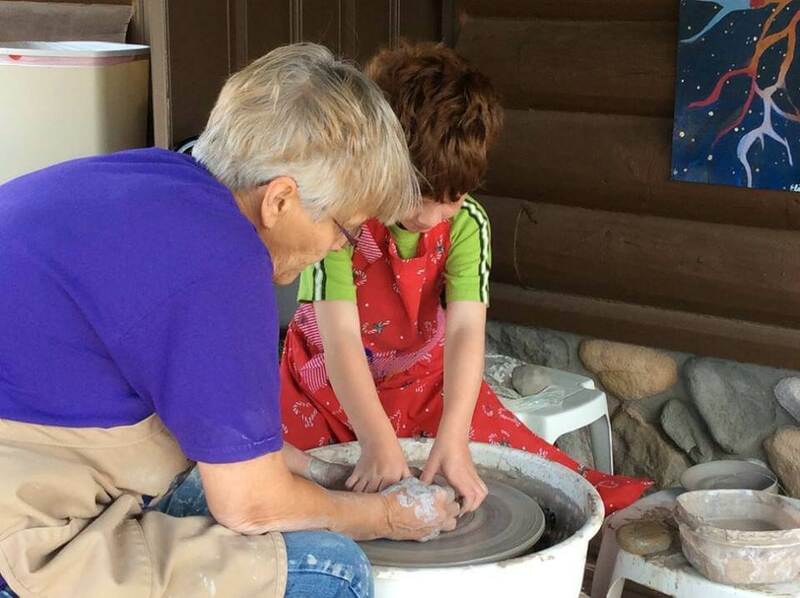 Artist Rita Kickert shows young LOLA student how to use a pottery wheel. We create A special gallery exhibit for Youth Art Month. 2017 YAM Display in the Artistree Gallery. We continue to seek unique arts opportunities for our programming from all areas of the fine arts, including dance. Share your story on social media! This is your chance to tell your own personal story of the transformative power of the arts in education on Facebook, Instagram, or Twitter! Add the #ArtsEdWeek #BecauseofArtsEd to your post to be a part of the 2017 visibility campaign. Make sure to tag LOLA on Facebook, @Land O’ Lakes Arts – LOLA so we can read your story! – How has arts education had a positive impact on your life? – What are you doing now in work and/or life that is the result of your arts education? Did you have an experience during your arts education that affected you? Maybe teacher who gave you the courage to pursue an artistic career? Or a moment as a teacher that you saw a student succeed or be inspired? -Why is arts education so important? Engage in your own arts education by taking a class! Basket weaving class at LOLA. Explore our calendar and find an arts class or cultural event that interests you. 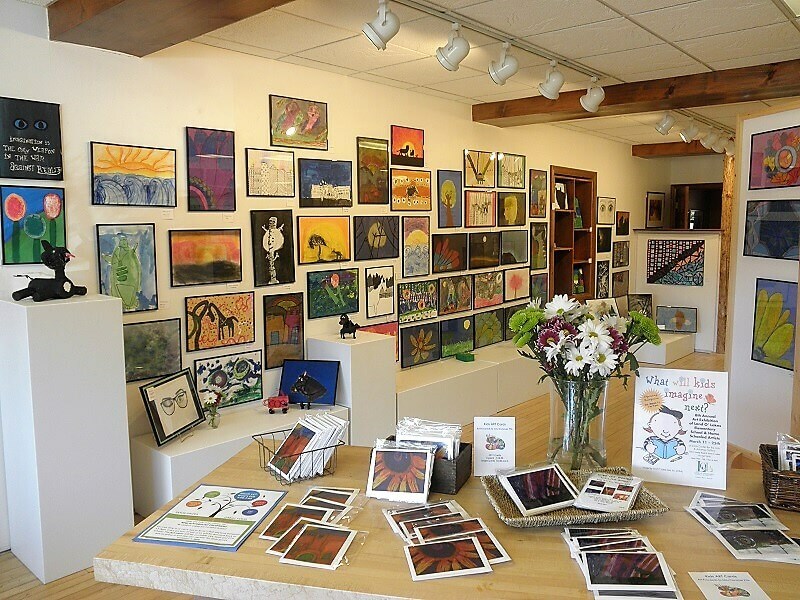 Or check out the offerings from one of the other arts organizations in the Northwoods. Click here to donate to LOLA. Your donation will help us continue to provide a variety of arts education opportunities for all ages, all year long. As a non-profit, LOLA depends on pledges, donations, grants, participation at fund raisers, and class attendance to fund our arts education programming. These funds help LOLA to acquire supplies for classes and hire diverse, skilled instructors to teach our students. With your support, LOLA can remain a reliable source of arts education for Northern Wisconsin and the Upper Peninsula of Michigan. Support LOLA and support arts in education! Posted in: News | Tagged: art classes, arts in education, donate, home school, local schools, LOLA, national arts in education week, what can you do?